After our long journey we woke up to this view of the beautiful Towers with a backdrop of blue skies and sunshine. I guess since moving the Chengdu I always like to emphasize my love of blue skies and sunshine! We were so impressed with the Trader's Hotel that I am going to write an extremely positive review on Trip Advisor singing the hotel and staff's praises! We woke up around 8 am and Jonny volunteered to head over to the Petronas Twin Towers to stand in line to buy tickets to go up in the Twin Towers and walk across the bridge. The kids and I headed down for breakfast and then back to the room to wait for Jonny to return. 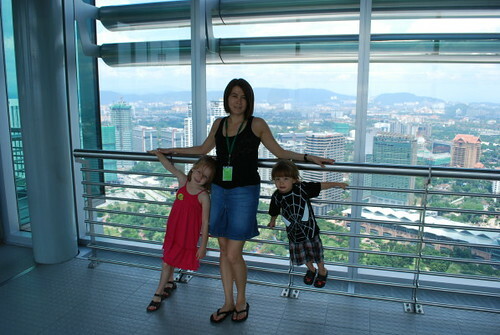 I was worried whether or not we would get to go up in the Towers as they only sell 800 tickets a day and it is an extremely popular site to see in KL. Jonny return about a 1 1/2 later with tickets in hand! 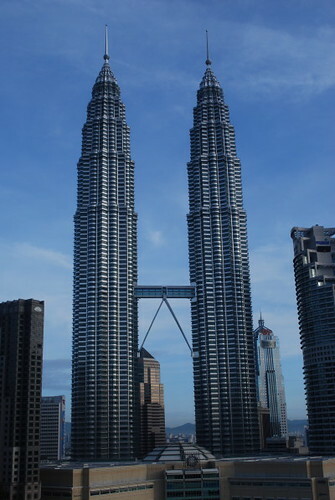 We had a 1:45 pm appointment to go up and see the Sky Bridge, so I headed over the KLCC to do a little swimsuit and sunglass shopping. The strangest thing about Asia is trying to find swimsuits. I found very few suits in Hong Kong last week and I was surprised again to not find a huge selection of suits in Malaysia. After my shopping trip I met Jonny and the kids for lunch. We ended up not having enough time for a sit down meal, so we headed to the food court where they had so many Malaysian hawker type foods. I settled for the Nasi Lemak and Jonny and the kids just snacked on Malaysian style potatoes and fruit. 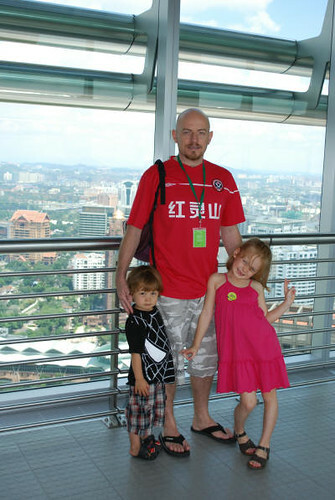 We headed to the Petronas Twin Towers and waited until it was time to go up. There was an informational exhibit and a short film about Petronas we saw before we headed up in the tower. We actually didn't get to go to the top of the tower, but to the Sky Bridge which is located on the 41st floor. The top floor is actually the 84th floor, but I guess it isn't open to the public. Here are some pictures from inside the Sky Bridge. 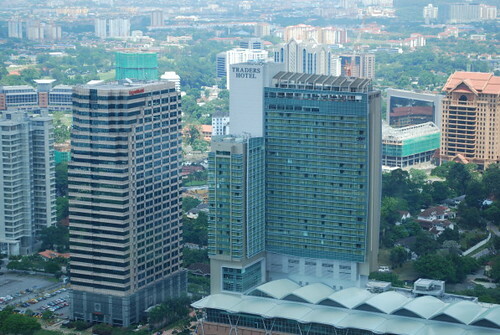 There is our hotel from the Sky Bridge. I am pretty sure our hotel has the best view of the Towers in the whole city!